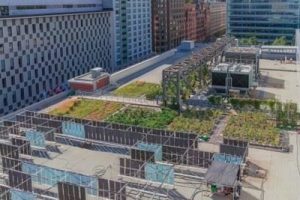 The Urban Agriculture Lab on the roof of the Palais des congrès de Montréal – the party Tuesday night will be here. Thank you for attending Plant Biology 2018! Here’s your guide for Tuesday and as always, when in doubt, you can check the schedule and the conference app, or stop by Registration and ask one of our friendly volunteers. There’s even more information on the Plant Biology 2018 network on Plantae, including a bit of tourist information in the “Sights and Sounds of Montreal” post. Also, if you haven’t already, please check out our code of conduct and social media policy— and hashtag #plantbio18 if you are using Twitter. Conversation Circles at the ASPB booth: 20-minute conversations about various ASPB programs and activities, at the ASPB Booth (booth 1413) in the exhibit hall. Today, CourseSource, ASPB presidents, and more! Roundtable discussions at the Plantae Pavilion Today, women in science and podcasting (with the hosts of The Taproot! )– meet at the Plantae Pavilion! More ways to boost your career! Lots of resources and opportunities throughout the meeting. On Tuesday morning, grab some coffee and head out to one of the concurrent sessions (8:30–10:15 AM, Concurrent Symposia 21–25, CO2 Regulation of Signaling, Reproduction, Plant-Microbe Mechanisms 2, Yield Regulation, and Photomorphogensis). After a break join the Women in Science Careers roundtable at the Plantae Pavilion (10:15–11 AM), or head to one of the second set of concurrent sessions (10:45 AM–12:30 PM, Concurrent Symposia 26–30, Biochemistry of Photosynthesis, Gene Regulation, Lab to Field, Environmental Responses, and Development Size & Shape). Electronic Jobs Board: Post jobs and resumes (all day, Plantae Pavilion). This is the LAST DAY for the jobs board. Resume Reviews / Mentoring Sessions (all day, Plantae Pavilion) Resume review and career advice from plant science professionals. Sign up at the Plantae Pavilion. This is also the LAST DAY for mentoring sessions! Improve your science communication skills by attending the roundtable on interviewing advice/podcasting with the Taproot podcast hosts (12:45–1:30 PM, Plantae Pavilion). Become an ASPB Ambassador (1:00–1:20 PM, ASPB Booth): learn about the benefits of ASPB membership or become part of the ambassador program. There will also be a final poster session from 1:30–3:00 PM. Attendees can visit the #plantbio18 Contest Awards and Celebration at 2:00 PM in the Plantae Pavilion, where the winners of the Pitch Your Science, best Selfie, best Plantae profile, and best conference tweet will be announced! Plus, Trivia! After this, ISPR, ASPB and CSPB present a joint symposium, The Ecophysiology of Photosynthesis from the Leaf to Global Scale (3:00–5:30 PM). Tuesday evening, visit the ASPB Town Hall meeting (5:30–6:30 PM), or the CSPB meeting at the same time. Then, come together to unwind at the closing party (8:00–11:30 PM). Finally, set your alarm for Major Symposium V: Mechanisms on Genome Evolution on Wednesday morning (9–11:30 AM).